Copyright, 1893, by Chas. W. Held. Words by Chas. Edwards. Music by Geo. C. Edwards. Covered o'er with dust of years, they lay upon the floor. Yet they brought to me the days I'll gaze upon no more. Tears now fall on the playthings I had when but a child. Where are now the happy hearts that joined my childish glee? Where the mother's joyous smile that seemed like heaven to me? Every tiny broken toy recalls his face to-day. 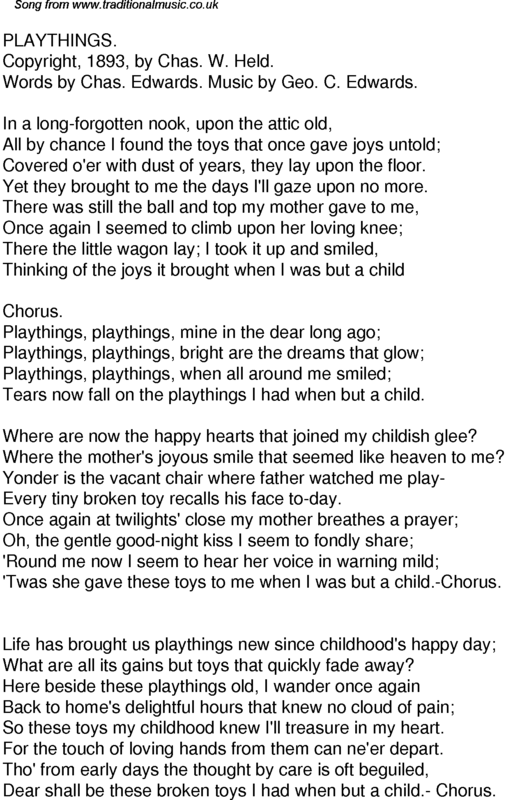 'Twas she gave these toys to me when I was but a child.-Chorus. What are all its gains but toys that quickly fade away? So these toys my childhood knew I'll treasure in my heart. For the touch of loving hands from them can ne'er depart. Dear shall be these broken toys I had when but a child.- Chorus.